The University of Oxford’s portrait collection is unrivalled in scope and diversity, and collectively constitutes the second largest portrait collection in the world – second only to that of the National Portrait Gallery, London. With over 3,000 portraits in the University and its constituent colleges, the collection is of major international importance and sheds a flood of light on the University’s history and interaction with other institutions, including government, monarchy and the professions. It celebrates the University’s past and present achievements, benefactions and international role in cultural life. The collection, whose portraits date from c.1450 to the present, includes unique images of significant individuals from all walks of life: leaders of nations, British and foreign monarchs, scientists, writers, scholars and artists. It includes paintings, drawings, sculpture, medals and photographs by world-famous artists. The Workshop commenced at the impressive new extension to the Ashmolean Museum for registration, coffee and welcome, before meeting curators Colin Harrison and Jon Whiteley. Dr. Whiteley focussed on the Museum’s collection of portraits of the Tradescant family: John Tradescant the Elder (d.1638), and the Younger (1608-1662) whose collection of natural history specimens and other curiosities formed the original core of the Ashmolean collection, as well as the latter’s two wives and two children. Thomas de Critz (1607-1653) is believed to be the author of several of these portraits while most are unattributed at present. Another key portrait is that of Elias Ashmole (1617-1692) (above) whose gift to the University of Oxford in 1683 established the Ashmolean Museum. The portrait by John Riley, and its magnificent carved frame by Grinling Gibbons, are believed to have been commissioned specifically for presentation to the newly founded museum. Mr. Harrison then shared some of the Pre-Raphaelite Brotherhood portrait sketches not on public display, which illustrate the enthusiastic patronage of Thomas Combe (1793-1872), superintendent of the university press, and his wife Martha. Together they befriended and financially supported Holman Hunt, John Everett Millais, Charles Allston Collins, later bequeathing their massive PRB collection of paintings and drawings to the Ashmolean. 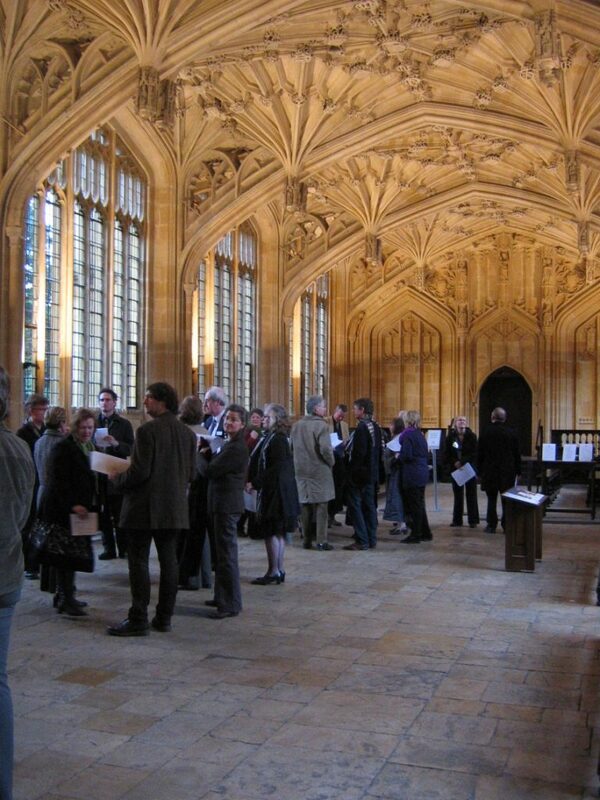 Moving on to the Bodleian Library, Anneke Bambery, Dana Josephson and Mike Webb introduced the origins and growth of the Library complex before taking small groups to see the College Founders’ portraits (some of them imaginary) and busts of Sir Thomas Bodley (1545-1613) and King Charles I by Hubert Le Sueur (c.1580-1658) in the fifteenth-century Duke Humfrey’s Library. In the Upper Reading Room, the group had a rare opportunity to examine the famous portrait frieze of 1618/19 depicting 202 celebrated intellectual figures, as well as a range of framed oil portraits such as Archbishop Laud, after Van Dyck. A visit to see architect James Gibb’s Radcliffe Camera, with portraits of the building’s patron, architect and builder, concluded the Library tour. See an illustrated history of the Library here. Following lunch in the Red Room at New College, Dr. Michael Burden welcomed the group into the relatively homely setting of the College’s Senior Common Room. The portraits displayed here depict former students, Fellows and Wardens, among others, demonstrating how a college collection can develop through gifts, purchases and commissions. Highlights include Romney’s Henry Bathurst, a miniature of Henry Prince of Wales (1594-1612) possibly by Isaac Oliver, and a range of caricatures and contemporary portraits. Dr. Burden concluded the tour with a visit to the Hall, designed to seat 200 at mealtime, where more of the college portrait collection is displayed. At the Examination Schools, Dr. Annette Peach led the group around the various rooms and halls normally used for lectures and university exams. The Schools’ is home to some of the most formal ‘state’ portraiture owned by the University, depicting monarchs, University Chancellors and Burgesses (MPs for the University) and military heroes, collected here to serve as exemplars for younger generations. Among the portraits are Thomas Lawrence’s whole length King George IV, King William III and its pendant Queen Mary II attributed to Kneller, Tsar Alexander I by François Gérard, and the Duke of Wellington by Sir Francis Chantrey. These grand bravura works contrast with the domestic setting of Tissot’s Baron Carlingford (1871) and G F Watts’ Marquess of Lothian (c.1875). The portraits at the Examination Schools have been fully catalogued on the Portraits in Oxford website, edited by Dr. Peach.